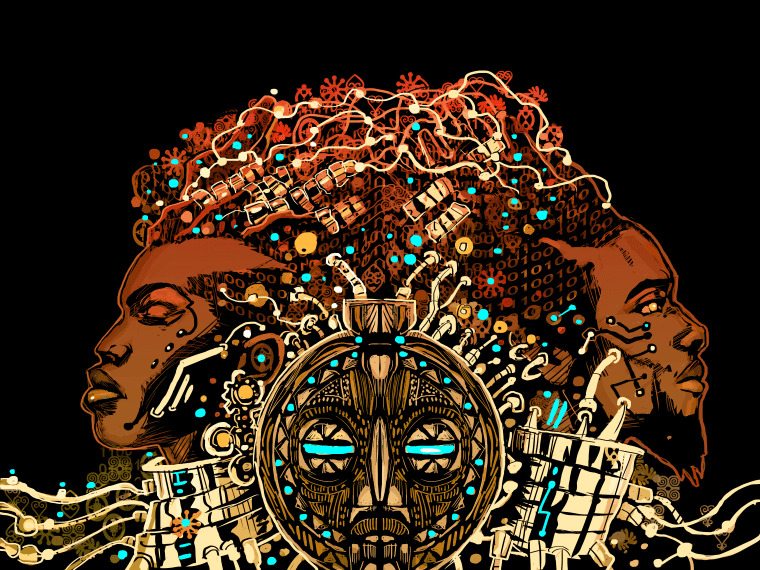 Afrofuturism and the Power of Black Imagination…Can You Dig It? How often do we allow ourselves the opportunity to re-imagine the Black experience? This question is suspended in mid-air during a time when blackness is either trivialized, as depicted in films like “Dear White People”, or suppressed when cases like those of Sandra Bland, Tamir Rice, Eric Garner, and Michael Brown continue to question our status and comfort as both citizens and African-Americans. New York Comic Con 2015 quickly came and left with an agenda filled with discussions on the future and need for diversity in comic books, featuring Alex and Eric Dean Simmons. In light of recent events that surround the lack of minority representation, this literary genre that emerges in popularity, fuses together elements of Afrocentrism, science, history, and fiction in order to re-envision stories of Black strength. afropolitanism: black people belong in all spaces. afrofuturism: we belong in all times. This is Afrofuturism, a term coined by Mark Dery, an American author who defined it as “…speculative fiction that treats and addresses African-American concerns in the context of 20th century techno-culture – and more generally, African-American signification that appropriates images of technology and a prosthetically enhanced future." While this genre made its inception via literature and graphic novels, it became a personal admiration once the connection between music and Afrofuturism had been made with musicians like Janelle Monae, Outkast, Erykah Badu, and Raury. There are some interesting intersections between Afrofuturism and hip-hop. “These artists, in a contemporary space, are also drawing from their personal histories and their global, national, local histories as well,” said Deirdre Hollman, Director of Education and Exhibitions of the Schomburg Center for Research in Black Culture. “We are so conditioned to compartmentalize with different topics like Afrofuturism and hip-hop,” she continued. However there's palpable evidence of their intersection. It was there that John Jennings, a visual design professor from SUNY Buffalo, spoke about the fusion of identity, literature, technology, Africana Studies, and other elements of academia into Afrofuturism. Most of these stories are told through graphics and comic strips like the ones Jack Kirby and Stan Lee created. As he continued to dissect the elements of Afrofuturism which he intertwined with his personal narrative, he discussed his role as co-curator of a new exhibit at the Schomburg Center titled Unveiling Visions: The Alchemy of the Black Imagination which "confirms that Afrofuturism is part and parcel of the zeitgeist by adding current trends concerning human and technological obsolescence, time, futurity, and economic and ecological forecasting in order to understand the full picture of what plagues our collective consciousness." After his lecture, he opened up a small Q&A which generated conversations on race, gender, and identity. Afrofuturism is an inclusive genre; stories are always being created where the main characters are from the LGBTQA community in all walks of life and females are taking control of their own lives in narratives written by writers like Octavia Butler. Afrofuturism challenges pop culture because it “is an appropriation of our oral history” where the most popular aspects of life, entertainment, and culture have been extracted from personal narratives and reformed for mass consumption, as Jennings described it. He even called hip-hop a cultural hacking because it’s a shifting tool, just like African-American awareness and black imagination. The Unveiling Visions exhibit is on display at the Schomburg Center for Research in Black Culture between October 1 to December 31, 2015. Follow NBCBLK on Facebook and Twitter. TJ Henry is an intern for NBCNews.com. He started in May 2015 and attends Rutgers University. He studies Communication and French with a focus on mediated communication.